It’s Sunday, you are ready and dressed, you’ve had breakfast and a cup of coffee, and you are headed for the golf course. What are you wearing? Maybe it’s a luxury Lacoste shirt, maybe it’s a simple Adidas jacket. In any case, it is your day to relax, head to the golf course, and enjoy. With this, we are highly supportive. Therefore, we are eager to share with our audience the bet Sunday bags. You guessed it, didn’t you? Well, do you know what a Sunday bag actually is? It is, in fact, a lightweight, smaller, and travel-friendly quality golf club carry bag that is designed to not carry a full set of clubs. Instead, it is designed to carry five-eight golf clubs, depending on your needs. So, if you are heading to the range, or need a quick set of golf clubs for a short travel excursion with the boss, these bags are worth considering if you plan to travel or at least have a short game on the course. Therefore, we want to jump in with the best Sunday golf bags and what individuals can look forward to as far as design, comfort, and durability. As the first Sunday bag on our list, this product is designed to be effective, high quality, and great for travelers on the go. This product takes up little space, it is designed to fit easily in most places and individuals may like that it can easily be stored neatly until you are ready to travel again. Let’s talk about the ProActive Sports 5” Sunday Bag and what individuals will like about this product. This product is not selective as to whether you are a novice golfer or a professional golfer. This product is intended for golfers who want the opportunity to be able to take quality clubs on the go. If you are seeking to easily take a couple of clubs during your next trip, this is the bag to get. This product has many different comfort features. These features include the fact that it comes with a padded shoulder strap for easy carry comfort and it also comes with a convenient handle for quick pick up. With that, it has plenty of pockets for carrying golf balls and other important items such as tees, divot tools, and more. The best part is that it is very durable and can easily last for many travel years and fun trips. Let’s discuss the price and the overall quality of this item. For the price, which is roughly under twenty bucks, individuals get a product that makes it very easy to carry all of the equipment and gear that you may need on the golf course. With this, the overall design of this product is perfect for all day wear and tear and it is even small enough to easily be stored in the trunk of your car. Most importantly, it is also easy to clean. Made of durable polyester fabric. Quality design and perfect for beginners. Padded shoulder strap for comfort. Pockets for different important items. Easily keep it in your car. It is time to bring this list up a notch. As product number two, this next Sunday bag is perfect for all day wear and tear and individuals will find it to be very high quality, adjustable, and has plenty of positive features making it a great addition to any golfer. This product has a couple of nifty features you will enjoy. This is the JEF World of Golf Pitch & Putt Sunday Bag. This product is not only a small club carry bag that is designed to be easy to carry and convenient. This item actually also comes with a stand that makes club selection extremely easy. Individuals will find this feature to be very convenient, especially if you are on the course for long periods at a time. 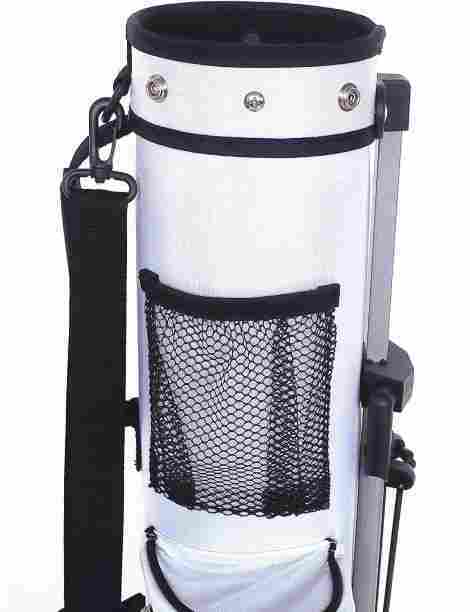 Overall, it is not only a travel product, but it also serves the purpose of acting much like a regular stand bag. This product is very accommodating, individual can expect this item to only weigh about two pounds when empty, and overall, be very easy to carry. 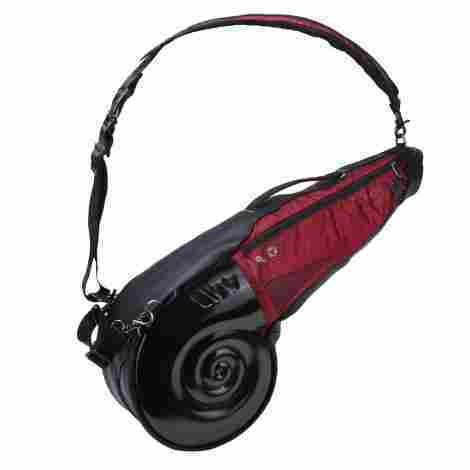 In fact, it even comes with an adjustable carry sling that is easy to place over your shoulder and go. The best part is that it can accommodate up to eight golf clubs at one time, so you can really make the best of this product. As far as the price for this popular product, it actually is very affordable considering it has professional stand bag features. With this, individuals will find this product to be effective for all day wear and tear and very easy to travel with. It has 4.5 stars and currently, the price has dropped down by 20%, so get it while you can. Can accommodate up to eight clubs. Weighs only about two pounds. The carry strap is poorly designed. 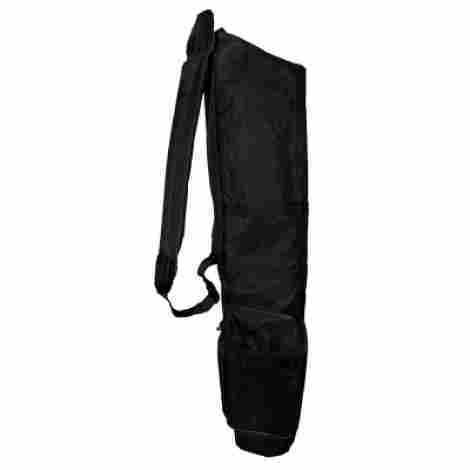 As the next product on our list, we want to share the lightweight stand carry bag that is this particular product. This Sunday Bag is great for all individuals that want an easy to carry item. Now, it comes in various color choices so individuals can really match it to their style and their overall clubs. 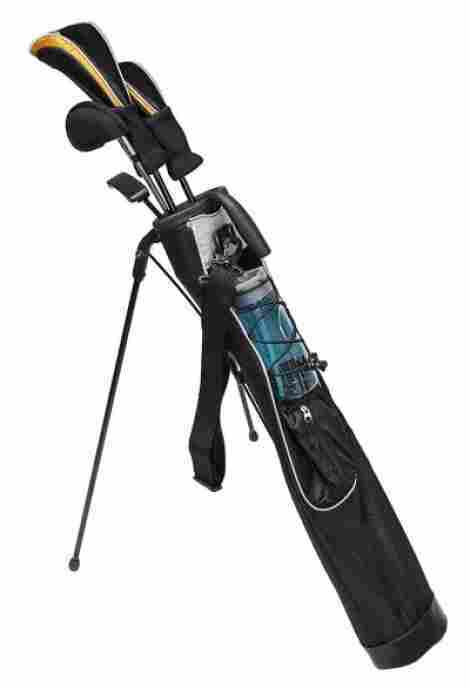 This is the Orlimar Pitch and Putt Golf Carry Bag. Here are two awesome features. As we said above, this product comes in various color choices. The colors are very colorful and individuals will notice that they will not fade in the sun and even be a bit rain resistant. Now, the most important part is that the product acts a stand bag, so individuals can enjoy the fact that it stands by itself easily and effortlessly, so you don’t have to keep bending over. As the next feature, users will like that the top compartment top is separated by a two-part compartment. With that, the top compartment is also cushioned with a mesh layer and it is designed with a durable carry handle so it is easy to carry and adjust on the course. The overall construction is lightweight and the product itself is very skinny and easy to carry all of your best clubs. So, how much does this product go for? It actually is priced at about the same price as the second product on our list, the reason being that it is very high quality and simple, and boasts many of the same features. To add to this, the overall design is lightweight, durable, and designed to last many years of travel fun. Pick between red, orange, pink, or even black and enjoy a simple and easy to carry product. Lightweight and different color choices. The strap stitching is poor. Not the best for a full course. This next bag on our list is designed to hold 6-7 clubs, including a driver. We are talking about the quality K-Cliffs Driving Range Mini Course Travel Case and we want to share and discuss with our audience what makes this product an excellent addition to the golf course. It is improved, different, and designed with durable aspects that make the product last longer than it’s predecessor. Let’s talk about the two features to consider this product. It seems that many individuals were not happy with the way the older travel case was designed. With that, the brand designed this product with a new and improved design. This new and improved design included a shoulder strap with a comfort pad for added support. Alongside this, the strap is also detachable, making it easy to carry, store, and use at your convenience. The body of this particular product acts as a plastic carry tube for all of your clubs. To add to this, the cube is designed to be fully padded and very durable. The padding allows for none of the clubs to get damaged. With that, the exterior of the product is water-resistant and can handle plenty of wear and tear during travel. As far as cost and value, we want to share that this product is very high quality and simple to carry. The padded handle and strap make for an excellent product design that is convenient and easy to use. The improved design, the overall value, and the pocket design allow for added flexibility. It has a rigid body, a great design, and it is priced a bit below normal carry bags. Improved zipper direction and durability. Two sided pockets for carry comfort. Shoulder strap can be detached. Not for the golf course because it completely closes in your clubs. As the next item on our list, we want to discuss with our readers this high-quality product from a leading brand in the industry. CaddyDaddy has long been known as a leading brand in the golf industry for their masterful products and well-designed styles. Today, we bring you the Ranger Carry Bag and two features that a user can expect if they are considering this easy to travel with product. When we talk about the fabric of club bags, we often talk about polyester and sometimes leather, even faux leather. With that, this product is designed from tough fabrics in the world. This item is made from 1680D nylon fabric, which happens to be extremely durable, high quality and designed to withstand the test of time. Even better is the fact that this brand has included with this product a one-year full bag replacement warranty in the case of any damages caused during travel. This item is designed with extra design benefits. These benefits include the fact that the brand has designed this item with three zippered pockets and even one towel ring. To add to this, the item has padding, is highly durable, and even comes with a 5” rigid tube design with a molded base. Overall, the 7-9 club design makes it easy to carry your favorite items. What do you think about this product? Very high-quality right? Well, we think this is among the best rated designed for a quality travel bag. It is durable, you get a warranty, made of a quality fabric, and the design is even padded for easy and convenient carry. With features such as this, you are getting an excellent product that is designed to last. In fact, many reviews say the same thing! To add to this, it is priced to the average price of other bags and it actually comes with more features and brand guarantee. Three zippered pockets and a towel ring. Rigid rube with molded base. Can be awkward to take clubs in and out. The side pockets are small and tight. If you are feeling a bit patriotic, we have a quality product that is designed to be easy to carry and has the American flag all over it, literally. This brand has some of the top of the line design features and products in the industry. 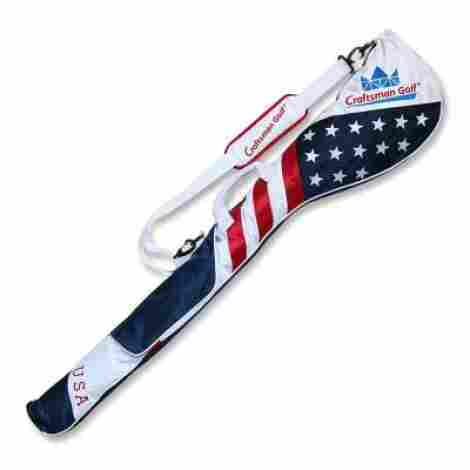 We want to share and discuss with our audience the Craftsman Golf Stars and Stripes American USA flag club case and what individuals will like as far as the features. The material of this item happens to be polyester. Now, when the polyester is involved in products such as this, they are designed with the greatest durability features. This item is designed with many of those features. For instance, individuals can expect this bag to be water-proof and wind-proof. Yup, not just water-resistant, but waterproof! To add to this brand dedication of durability, they actually designed this product with a nylon carry strap to add to the durability. With that, it allows for convenient and easy carry alongside a quality padded handle design and an accessory zipper pocket. Also, the strap is adjustable and detachable in the case you want to remove it so it does not get snagged during travel. As far as the price, this product is a bit below the average price for many other Sunday bags, but the durability is by no means below many brands. This product is high quality, durable, and designed to be comfortable to carry. Designed by this leading brand when it comes to gear, individuals can trust this item. Quality design and completely folds down. May be too tight for more than six clubs. As the next product on this list, It is time to share a brand that has long been known as a leading brand in the golf community. Titleist has many awards and has been distinguished as a professional golfers brand. Well, today, you can get one of their quality Sunday bags and join the team. 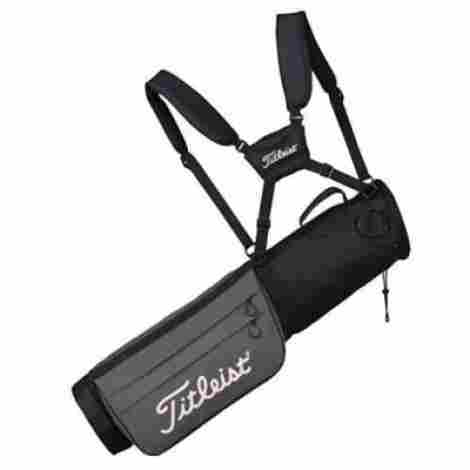 This is the Titleist Sunday Golf Carry Bag and we want to discuss two features users can expect from this product. So, this feature happens to be new on this list so far. This product has a double-to-single convertible strap system. The convertible strap system is designed to make it easy to carry. Individuals can easily select between carrying the bag as a single strap or a double strap for better back support and more supportive carry. This item is not fully water-resistant but it does have a couple of water-resistant features. For instance, this item has a water-resistant zipper and valuables pocket where water cannot enter. With this, individuals can protect their important items such as keys, wallet and more. With this, it has a total of four pockets, making it easy to also carry gear, balls, tees, and more. As far as the price for this item, users will see that it will be a bit higher than most brands because this brand is known as a leading distributor of luxury golf clothing and items. With this, we recommend this product if you want travel luxury and quality features. Overall, this it is convenient, but for the price, if you don’t care much about the name, there are many other brands to consider. As the eighth bag, we want to share, it is time to discuss a bag that is designed to be durable, high quality, and made of a valuable construction design. This is the A99 Golf C4 Range Sunday Pencil Bag and although it is not designed to be collapsible, it is designed to offer premium quality durability and features. We want to discuss why this product is such a high-grade quality and why users tout it for its magnificent qualities and design benefits. The zipper of this product is a full-length zipper panel that has a quality design that is durable and made of a woven and laminated material design for added trust and longevity. To add to this, the zipper panel entry is made to be easy to take out and remove the clubs. 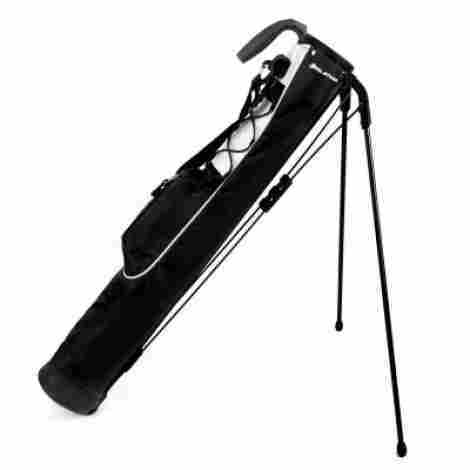 Alongside this, it is not collapsible, but the tube body protects the clubs very well. The interior of this product is a PE tube that is very durable. However, the exterior material enhances the overall quality of this product. The exterior of this bag is made of a nylon fabric that is designed to be waterproof, easy to clean, and even rip resistant. This allows individuals to trust the bag and the overall design of the product, which allows for convenient travel and safety requirements. To discuss cost and value, the price of this product suggests that it has more premium features that other bags. Part of these premium features is the quality tube design and two easy cover strap system. To add to this, the exterior is made of a quality nylon fabric that is designed to last. It comes in four color choices and the overall value will last for years. To add to this, this brand is well trusted in the industry. Can golf half set clubs. Water-proof and quality exterior fabric. The legs do not hold up well. Can be a bit heavier to carry than most bags. Before we move on to product number ten, we want to discuss a quality bag that goes back to our roots. This product is much like bag number one on our list. It is simple, easy to carry, and designed to be convenient. To add to this, it is perfect for travel, fits in the back of a car, and can even be rolled for easy safekeeping. This is the Stripe Golf Sunday Lightweight Travel Bag. 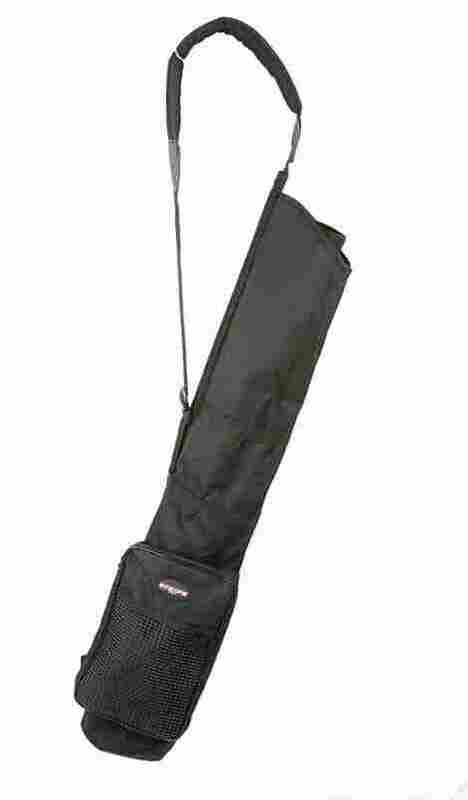 This item has valuables pockets that are designed to make it easy to include products to carry with your clubs. Take your tees, wallet, keys, and cellphone easily with this bag. The pockets are even big enough to carry a couple of your favorite golf balls and other golf gear you may want to include. This product has a padded strap design that makes it comfortable and easy to carry. The padded strap is designed very well and stitched so it can withstand a lot of travel. It makes carrying the bag easy and convenient. This item is very simple and nothing too out of the ordinary. The overall design is convenient, high quality, and designed to be comfortable. With this, it is perfect for beginners and other individuals that want a simple carry bag. If you want to carry a few clubs with you to the range, do it with this lightweight bag. As the tenth product on our list that we are going to share is the Wellzher Natilux Driving Range Carry Bag. This item is designed to be very unique and very different than most bags we have talked about. This item has some of the most unique design elements such as the use of nylon, aluminum, and polyvinyl. Here are two features to consider the last item on our list. This product has a four-layer protection shell. The four-layers are designed to protect the golf club heads and designed to be made for quality and durability. The layers included a non-woven fabric, an aluminum coil, polyvinyl, and nylon to enhance the protection of the content inside of the golf carry bag. This product is designed from a quality fabric known as HydroX. HydroX is this brands unique and completely water-resistant fabric. This fabric is designed for durability, quality, and happens to protect the golf clubs very well. To add to this, the fabric is able to withstand wear and tear, rain, wind, and even dust, ensuring that your clubs are protected at all times. As far as the price and benefits, this product is one of the most durable and high-quality designs to consider. Currently, it is like a hidden gem in the golf community because it has minimal reviews, but individuals will notice that the design is very convenient and high quality. Overall, we recommend it for the design and the unique style, which comes in many color choices. Dust resistant and water-resistant design. Quality anti-slip leatherette for durability. Hard to pull clubs out of bag. Considered heavier than most bags. So, have you picked the best bag for you? If you notice, there are two types in the industry that are considered Sunday bags. There are bags that are for travel only and there are some for travel and use. All of these details will jump into in the next portion of our article the criteria and frequently asked questions. We want to move forward and share with our audience the criteria for the perfect evaluation of all of these bags. With this, we shed some light on the important aspects to consider of a Sunday bag and we shed some light on the different valuable information that will help select the perfect item for you. Let’s begin with the evaluation portion of today’s guide – and the criteria that we used to choose each product. As the criteria to evaluate the best Sunday golf bags, we wanted to share with our audience all of the different and important nuggets of information that we learned when picking out the best products. Alongside this, we want to discuss the many different aspects that were very valuable and worth considering. As aspect number one, it is important to know which bag is the best for you. In the industry, there are two types of bags to consider, carry and travel. With this, we discovered that travel bags have convenient features that make it designed for the purpose of travel. However, they are not as convenient when it comes to using them on the golf course. With that, we want to look at the differences of each bag and what users can look forward to when looking for one or the other. Here are some of the many features of a quality travel bag. Durable fabric to withstand wear and tear. Designed with water resistant features for travel security. Designed with cover and zipper to protect the club heads. Designed to be foldable for easy carry and storage. With that, the major difference between travel bags and golf carry bags is that travel bags are often designed with a closing top feature that will protect the clubs. Below are some of the features of a golf carry bag. By carry, we mean golf bags that are designed to be used on the course. They will have an open top design to easily be able to insert and remove clubs. They will have a padded strap for convenient carry. They will have a kick-stand for a self-alone stand design. With that, the major difference is that travel bags do not have a kickstand for the golf course and they are designed with a closed top. Now we want to move forward and discuss the most common materials that we recognized when sharing the best quality Sunday bags. These materials are designed for ultimate durability and quality design, allowing for all-day wear and tear. Let’s discuss the features of each material. Polyester is a common material because it happens to be cheaper than most. With this, this material happens to be durable, last the test of time, easy to clean and be water-resistant if coated correctly. This is the most common, but it allows individuals to have a foldable and easy to pack and carry product. This material is not as common, but also not very rare. Nylon is known as the most durable and wear and tear resistant in the industry. In fact, nylon is what many tactical pieces of equipment are made from. With this, nylon is often used for the straps of the product to enhance the durability and ensure rip-resistance. Leather is common among brands that want to focus on luxury. As a very rare material, a leather Sunday bag is most common among premium luxury brands that focus on quality material designs and enhanced styling. Other materials that are common but also rare include. As the last criteria, the features and benefits of each bag are very important. With this, we want to break down the feature and benefits as bullet points, so they are easy to pick out and read. We recommend our audience to consider which of these features is the most important for their purpose so they can select and pick out the best product. This is a very common feature in the industry among Sunday bags or travel bags because of durability purpose. With this, many bags even have water-resistant or waterproof pockets and zippers to enhance the overall durability of the product. This is an important feature to consider if you want maximum protection for your clubs. As another feature to consider, enhanced padding is an important factor, especially if you want a quality product that is comfortable for you. The most common areas of padding include the bottom, interior, and straps of the bag. This allows for safety for the clubs and safety for your shoulder. Also, some items even have padding on the handle for easy grip and comfort on your palm. Many bags have as a feature a two-way top design. The two-way top design allows individuals to be more comfortable and be able to use the bags conveniently. With this, most commonly an individual can only carry five to eight different clubs at a time. Overall, the two-way top allows for convenient carry of your clubs while also separating them. With this in mind, we want to share other features that are common and should be considered. Now that we have talked about these great and beneficial features. We want to move forward and answer some questions for you guys! Q: Does the bag have a TSA lock? A: Only specific bags have a lock. However, it may not be TSA approved. Therefore, it is important to consider what kind of lock it is and buy the appropriate one if needed. Q: How do I clean the inside of the tube? A: This is a great question. If you have a PE tube, then you can wash it out with water. In any case, you can always wipe down the inside and outside of the bag with a wet rag. Q: Are the zippers waterproof? A: Most commonly they are water-resistant and the bag includes a valuables pocket for important gear. Q: What is the most common club count I can take with me? A: Five to eight clubs, depending on the bag.